KUALA LUMPUR, 19 SEPTEMBER 2018, WEDNESDAY: Sarawak Energy shared its strategy roadmap in pursuing a sustainable, affordable and secure energy future for Sarawak and beyond with a national and international audience from the power industry at the Conference of the Electric Power Supply Industry (CEPSI) 2018 at Kuala Lumpur Convention Centre here today. Sharbini Suhaili, Sarawak Energy Group Chief Executive Officer, delivered a presentation on how Sarawak’s primary electricity provider and energy developer is adapting to the changing global energy scenario through digitalisation, innovation and research into alternative energy sources at a keynote session themed ‘Future Utility and Sustainable Development’. Also on the panel were speakers from international companies Brad Gammons, Global Managing Director IBM Energy, Environment and Utility Industry; Dr Alexander Kotouc, Head of Product Management BMW i, BMW Group and Dr Ken Koyama, Chief Economist and Managing Director, Institute of Energy Economics, Japan. The conference was declared opened on Tuesday by Yeo Bee Yin, Minister of Energy Science, Technology, Environment and Climate Change and featured a special address by Tun Dr Mahathir Mohamad, Prime Minister of Malaysia. Sharbini’s presentation entitled ‘Digitalising Our Business: A Sustainable Energy Future for Sarawak & Beyond’ touched on some of major initiatives Sarawak Energy has embarked on towards becoming a digital utility by 2025, with its people as the core of the transformation and on integrating digital technologies applications. This gave the audience of international utility leaders and industry experts and players insight into Sarawak’s perspective towards ensuring a sustainable energy future for the state. 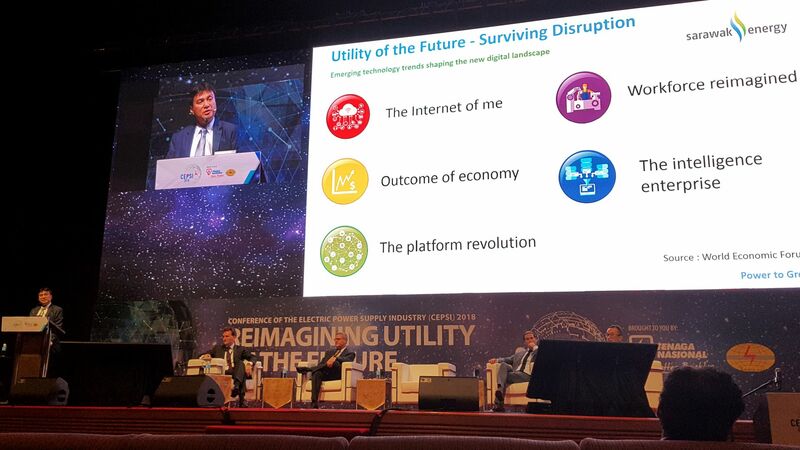 In addition to giving a brief overview of Sarawak Energy, Sharbini highlighted the utility’s three-pronged digital journey focusing on People, System and Process. Sharbini said, “The rate at which the global energy scenario is transforming is astonishing and we are aware that if we want to remain relevant and move into the top quartile level of the industry, we need to continuously adapt to align our people, process and systems to keep pace with the changing global scene and a successful digital journey. While we pursue initiatives to adopt technologies that will change the way we operate, people are at the heart of this." “We can have the best technology and equipment but if we do not have a workforce that is knowledgeable in utilising and optimising these technologies, then we will not be successful,” he emphasised. Sharbini said that Sarawak Energy was also exploring new opportunities in a green energy economy. In addition to exporting renewable energy to Indonesia, Sarawak Energy was also piloting a hydrogen production and refuelling station. “We are taking a strategic position with our early involvement in hydrogen so that we can exploit potential opportunities as the technology matures and becomes commercially attractive. This pilot hydrogen production and refuelling station allows us to research the commercial viability of a hydrogen economy through the production, delivery, storage and utilisation of this clean energy including industrial applications as well as for greening the transportation sector." On the side lines, technical sessions were held simultaneously during the three day convention. Sarawak Energy representatives from various departments also presented their papers at these sessions. 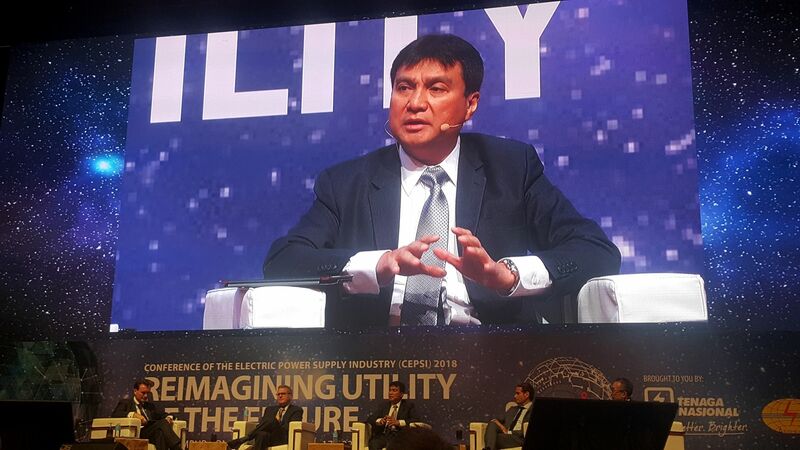 Sarawak Energy Group Chief Executive Officer Sharbini Suhaili delivering his presentation at one of the keynote sessions at CEPSI 2018 in KL. Sarawak Energy Group Chief Executive Officer Sharbini Suhaili shares his thoughts during the questions and answers part of the keynote session. 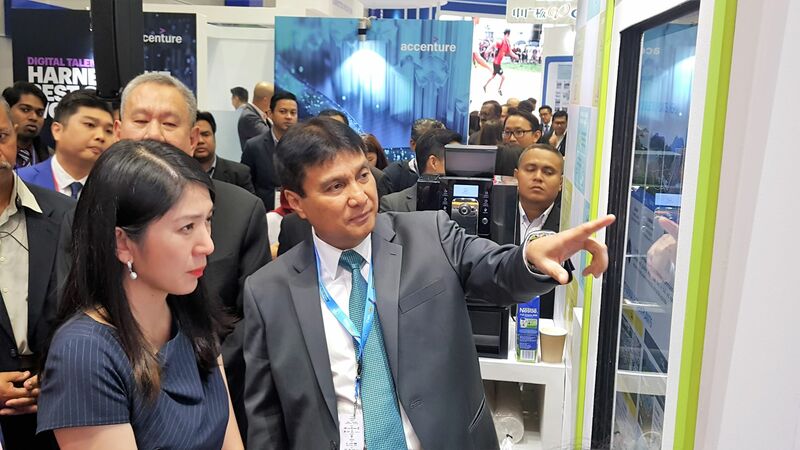 Sarawak Energy Group Chief Executive Officer Sharbini Suhaili sharing Sarawak Energy’s story in pursuing renewable, affordable & reliable energy development with Minister of Energy, Science, Technology, Environment and Climate Change Yeo Bee Yin at Sarawak Energy’s booth at CEPSI 2018 exhibition.